Which seems like the better bet to you: 6 lotto numbers from 50 possibilities ... or 6 numbers from only FIFTEEN? Let Analysis Lotto show you how to pick winners for ANY lotto or keno game from a mere handful of numbers! Use any of 8 systems - including our unique Delta system - to analyze drawings and guide you to winners. Insightful graphs and reports. See at a glance which numbers are hot or cool - even which numbers are GOING to be hot. ...... Insightful charts, graphs, and reports show you exactly what's going on in your game. See at a glance what numbers are hot, and which are cool. You'll even see which numbers are GOING to be hot. Analysis Lotto's import feature lets you collect drawing information from nearly any lottery page on the internet, and even export that data to other lottery software. Our powerful data filter lets you analyze drawings based on weekdays, ball sets, or anything else you can imagine. 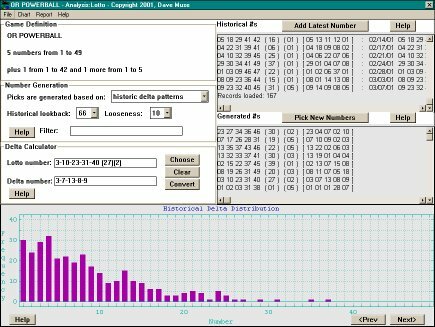 Analysis Lotto is powerful enough for your own research on lottery, lotto, or keno games - or easy enough to be used with a single button push on any of the 140 included popular games from all the US states, Canadian provinces, Europe, UK, Australia, South Africa, and the rest of the world. CastleLotto is lotto analysis and prediction software for Windows. Evaluate the impact of variations in your model's critical variables. Qweas is providing links to Analysis Lotto 3.5 as a courtesy, and makes no representations regarding Analysis Lotto or any other applications or any information related thereto. Any questions, complaints or claims regarding this application Analysis Lotto 3.5 must be directed to the appropriate software vendor. You may click the publisher link of Analysis Lotto on the top of this page to get more details about the vendor.